Autumn is coming to the West Midlands county, so that means one thing, Fireworks, bonfires and traditional food. Enjoy these Upcoming West Midlands Bonfire Night Firework Events. This is your banging fireworks guide for 2019. Why not come and join us on the Seasonal Forum. Where you can find more events in the West Midlands (County), and deals from our sponsors, with help from our excellent community. Bentley Heath School PTA Fireworks Spectacular! Peterbrook Primary School Bonfire and Fireworks! Time: Gates open at 5:30 pm. Venue: Field Opposite, 157 Kidderminster Rd S, Hagley, Stourbridge DY9 0JB. What’s on: Food, Fun, hot/cold refreshments, fireworks. Price: Early bird coming soon. Time: starts at 17.00 pm, fireworks at 19.30 pm, closing at 21.00 pm. Venue: Four Ashes Road, Solihull, Dorridge, B93 8QE. What’s on: live entertainment, food stalls, and a fantastic firework display. Time: Gate Opening at 17:00 pm. Venue: The Wardens, Widney Lane (2.06 km) B91 3JY Solihull. What’s on BBQ, Guy Fawkes Competition, Competition judging, Bonfire, Firework displays. Price: Family – £15.00 (2 x adults, 2 x U16s), Adults – £5.00, U16s – £3.00, Ticket currently TBA, prices are subject to purchase before the event. Time: Gate: 6.00 pm, Fireworks: 7.30 pm. Venue: 140 Helmswood Dr, Birmingham B37 7LS, UK. What’s on Food, Fireworks, Music, Drinks, Novelty Stores. Time: Gates open 6 pm, bonfire 6.30, fireworks at 7 pm. Venue: St Margaret’s Church of England Voluntary Aided Primary School, Richmond Road, Olton, Solihull, B92 7RR. What’s on lush Food, Fireworks, Music, Drinks, Novelty glow Stores. Price: TBA Advanced tickets: Family £12 (2 adults 2 children), £4 Adults, £3 Children. More expensive on the gate and we often become full on the night. Venue: Old Edwardian’s Sports Club, Streetsbrook Road, Solihull, B90 3PE. What’s on Fair Ground Attractions, BBQ’s, Outside Bars, Bonfire and Fireworks. Price: Adults £5 per adult and children 12 and older. Kids under 12 go free. Venue: Widney Cl, Bentley Heath, Solihull B93 9AS. What’s on Fireworks and much more..
Price: Adults Advance tickets are available soon. Venue: Oak Cottage Primary School, Greswolde Road, B91 1DY. What’s on A fireworks display, licenced bar, café, face painting and chocolate tombola. Venue: Peterbrook Primary School, High Street, Solihull Lodge, Shirley, B90 1HR. What’s on Rides, BBQ, hot drinks, bar, toffee apples, candy floss, glow toys and much more. Price: Adults Tickets on sale soon. Time: Gates open at 20:00 pm. Venue: Aston Manor Cricket Club, Church Rd, B422. What’s on Kids mini disco, BBQ, Music, Fireworks, Fantastic Fun. Price: £4 adults £1 kids pay on the gate. Time: Between 6:00 pm – 11:00 pm. Venue: Coventry Road, Sheldon, Birmingham, B26 3PY. What’s on Bonfire, bouncy castle, BBQ, sweets, great fun, soft play. Price: Adults (13 years or older) £5, Kids (12 years and under) £3, Under 2’s go free. Time: Gates open 6.30 pm, Firework displays at 7.00 & 7.45 pm. What’s on: Delicious Food & Drinks: Spring Rolls & Samosas, Burgers & Hot Dogs ~Halal Chicken /Veggie Burgers, Candy Floss & Pop Corn ~Yummy Cakes Hot Drinks, and Bottle Bar~Mulled Wine Sweets ~and much more. Price: Tickets on the door: Adults; £10/Children over 3; £5. Time: Gates 5pm; Bonfire 6.15pm; Firework Display 7.15pm. What’s on: Tasty food and drink available all evening, Bonfire and fireworks. Price: Tickets are priced at £8 per adult and £4 per child (under 16). All children must be accompanied by an adult. Time: Gates open from 4 pm. What’s on: Bar, food, Music, Fireworks and a great night of fun. Price: £15 for a family ticket, adult ticket each £5 and children under 18, £3. For a safe fun night at any of these West Midlands Bonfire Night Round Up 2019, Please follow the rules, as most displays do not allow to sell or buy fireworks or allow animals. Please take extra care if you are attending on your own, take the extra money and a mobile phone for emergencies only. Did you enjoy this post? Please share it with your friends. Would you like more? 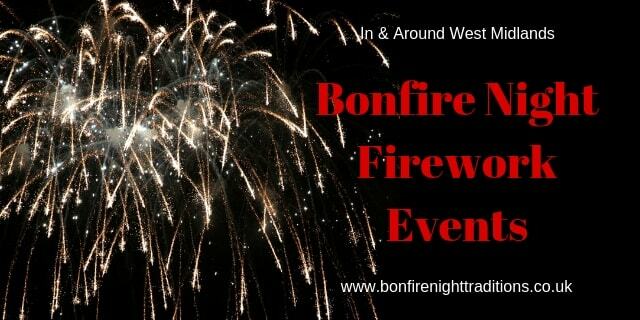 join us at the Bonfire Night Firework Displays in West Midlands Facebook group. Where all the latest West Midlands events are happening. Events Updated – 2019 Season. 1 event – added – 13/09/2018 – 12:16 pm. Added – 1 event – 05/09/2018 – 08:26 pm.